In December 2014, an Empowered Citizen Grant was awarded to Andrea Nevins, a 2014 MassSTAR delegate from Medfield High School. Andrea's grant award was used towards expanding the Massachusetts Miss Amazing Pageant held on February 28, 2015 at Medfield High School. In 2013, Irene and Chris were awarded $150 for their project of hosting a dinner at the Paulist Center. 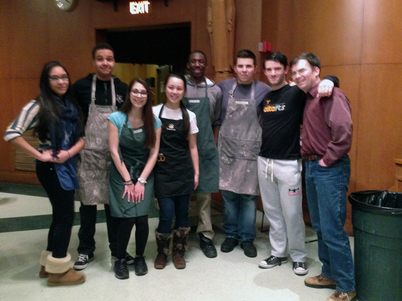 With the help of their Key Club, they were able to raise an additional $150 and serve a meal that was just as rewarding for them as it was for the guests they served. In December of 2002, four young boys drowned when they fell through the ice of the Merrimack River in Lawrence. This tragedy inspired Tracy and other members of the Andover High School swim team to prevent a similar tragedy in their community by revitalizing the swim team at the Lawrence Boys and Girls Club. Tracy and her team began giving the club members weekly lessons but felt that the inadequate swim attire of some of the club members, consisting of athletic gear and t-shirts, was unsafe. Tracy used the $1,000 grant to purchase team bathing suits, goggles, swim caps, and sweatshirts for the Lawrence Boys and Girls Club swim team. This contribution provided the children with safe swimming gear and helped unite the swim team as a legitimate team. When Matt learned about the Empowered Citizen Grant Program at the 2003 MassSTAR Citizenship Conference, he took the opportunity to contribute to Camp Arrowhead in Natick, MA. Camp Arrowhead is a camp for children and adults with special needs where Matt had volunteered the two prior summers. As a volunteer, Matt observed the strong sense of community the campers and volunteers shared all summer long and the long period of time between summers. Matt sought to continue this community bond all year round, and collaborated with two volunteers to apply for an Empowered Citizen Grant in order to found a monthly off-season newsletter. Matt used the $1,000 grant he received to pay to print the newsletter and to purchase the envelopes and postage needed to mail the newsletter to the campers and volunteers. This newsletter continued the camp’s sense of community throughout the rest of the calendar year, empowered campers by publishing their contributions, and enhanced the return rates of the volunteers. partnership with the University of Massachusetts Citizens Scholars to create an influx of volunteers who would assist the high school students in their path to higher education.